For the first time in team history, the Chiefs won their second consecutive AFC West title in 2017, leveraging a 5-0 start to earn their fourth 10-win season in five campaigns under head coach Andy Reid. Things were not exactly as auspicious as the above would suggest for Kansas City, though, as their defense finished last in our rating system, their special teams fell from a top-five unit to the middle of the pack in 2017, and their offense went through a mid-season stretch where they had a difficult time scoring in games versus mediocre defenses like Pittsburgh, Dallas, New York and Buffalo. Just a year after settling for a one-year, $1.797 million deal this past offseason, Wilson’s stock has substantially improved after hauling in a career-best-tying 42 regular season passes on just 56 targets. His 15 forced missed tackles on receptions during the regular season was tied for third among all wide receivers, and he was a plus player as a blocker in the running game as well. There is some risk here, as he is only one year removed from being one of the least productive slot players in the league (with only 0.60 slot receiving yards per route run in 2016) and the Chiefs are switching from the conservative Alex Smith to the seemingly-aggressive Mahomes. However, in Mahomes’ only 2017 start, he found Wilson 10 times on 11 targets for 147 yards (including 82 after the catch) against Denver. This would be a big get for the Chiefs, as they would be getting one of the Broncos’ best players at a position of significant need for Kansas City. While this indeed seems far-fetched, the Broncos are heavily-invested in Von Miller ($22.5 million cap number in 2018) and Shane Ray (a 2015 first-round pick) on the edge of the defense, and might need to spend the majority of their cap space (currently between $20 and $30 million dollars) to shore up the quarterback position in free agency. Despite his relatively-humble pedigree, Barrett has been the second-best edge defender for Denver for quite some time, earning the 15th-best pass-rushing productivity (10.6) among 3-4 outside linebackers in 2017 and generating 42 total pressures. While former first-round pick Dee Ford is likely to remain in the fold in 2018, he was far less productive than Barrett in 2017, earning the 40th-best pass-rushing productivity before a season-ending injury limited him to 316 snaps. The Chiefs played 2-3-6 dime defense on 43 percent of their defensive snaps this season, and have played a plurality of their snaps with six or more defensive backs for years now. 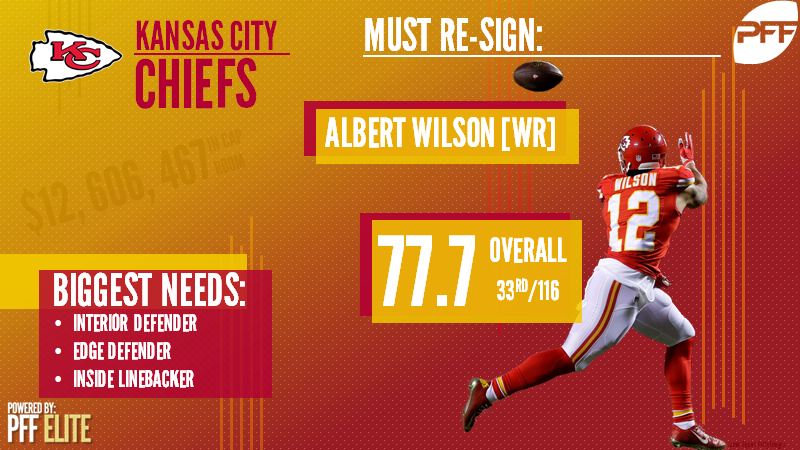 While Burnett is a starting-caliber safety (of which the Chiefs already have two), questions abound over the health of Eric Berry (Achilles) and the recent play of Ron Parker (40.1 player grade), making this potential move a shrewd one. Burnett filled a versatile role for the Packers a season ago, playing 339 of his 724 snaps in the box as a linebacker and another 244 lined up over the slot. Having Burnett in a trio with Berry and Parker would likely bring the best out of the latter two and lighten the load on third-year special teams star Eric Murray (44.4), a former cornerback who struggled when thrust into action in 2017. While the acquisition of Kendal Fuller is a welcomed (and long overdue) addition to the Chiefs cornerback room, it’s unlikely they will go into the 2018 season with the likes of Steven Nelson (76.8), and Terrance Mitchell (52.3, and pending free agency) competing for the right cornerback spot in their nickel and dime packages. Melvin, who excelled in the types of man coverages the Chiefs like to run, will be reasonably-priced commodity in a cornerback market full of more-popular names. He played only 552 snaps because of injury in 2017, but held opposing passers to a 60.3 rating when he was targeted, intercepting three passes and breaking up another 10. For a team that has had struggles against the run, the fact that Melvin missed zero tackles in 2017 would be a welcomed addition as well.